Have you ever thought about adding nuts to your smoothies? I tried it for the first time in this raspberry nut smoothie recipe and loved it. Nuts are a healthy source of protein and fats, and give you a nice energy boost from the extra calories. Before adding them, I was worried how they would affect the texture of the smoothie, but they blended in so smoothly that I didn’t even notice a difference! In this recipe, I use almonds and walnuts, but you can experiment with other types of nuts. If you don’t have coconut water, plain water also works just fine. Whenever I make this smoothie, I always get that piña colada song stuck in my head: if you like piña coladas, and getting caught in the rain… It gives me that tropical, vacation-y feeling. All you need to make it is pineapple juice, coconut milk, and frozen pineapple chunks. Don’t you think coconut and pineapple go so well together? I like to make fresh squeezed pineapple juice, but I won’t tell if you use juice from a can or store-bought. Both ways work great! You can freeze your own pineapple chunks ahead of time, or use store-bought frozen pineapples in the freezer section. Ahhh, now I just need some more vacation time and plane tickets to a warm beach somewhere! Fresh watermelon juice is simple, refreshing and delicious. It’s perfect in almost any circumstance: at a party, relaxing by yourself, accompanying a barbeque… the pairings are endless! I’ve added mint to this recipe because, well, why not! This is a great recipe to keep in your back pocket for when you hesitate while considering an entire watermelon in the store and think, “There’s no way I’m going to eat this whole thing.” Now you don’t have to! Fill Magic Bullet cup with watermelon cubes and mint leaves. Add a few ice cubes, along with a bit of water, depending on how thick you prefer your juice. Blend until everything is liquid. The watermelon alone is sweet enough for my taste, but feel free to add a bit of sugar if you have a sweet tooth. This Peaches ‘n Oats Smoothie is one of my favorite breakfast smoothies! It must be the oats; I love eating them in the morning for breakfast because they’re so filling and keep the hunger away for hours. I also like to sprinkle some oats on top when it’s all done. If you like your smoothies to have more of a chilled, slushy texture, freeze the fresh peaches for at least 45 minutes (or overnight) before adding them to the Magic Bullet cup. With a breakfast smoothie recipe this quick and easy, there is no excuse not to start the day off right! Freeze the peach slices for at least 45 minutes (optional). Add all of the ingredients to a Magic Bullet cup and blend until smooth. Sprinkle a pinch of oats on the top. This strawberry cucumber smoothie was made from leftover fruit I had in a fruit-infused water pitcher. Have you tried that before? Adding fresh fruit to a pitcher of water and letting it infuse for 4 hours really does make the water taste delicious! It will last a few days, but then you will need to remove the fruit and it is usually soggy; it’s perfectly good to eat, but not the most appetizing. I don’t like to waste food, so I always use the leftover strawberries and cucumbers from my water for this healthy strawberry cucumber smoothie. If you prefer your smoothies nice and chilled, you can mix in some frozen strawberries, too. With holidays around every corner, it’s always a great time to capitalize on champagne-themed or flavored dishes. And considering 95 percent of us have made resolutions to be healthier, why not try this champagne vinaigrette dressing on a healthy salad? While we’re still eating them, of course. Combine champagne vinegar and olive oil. Add vinegar, oil, shallot, mustard, salt, and a pinch of pepper to Magic Bullet and blend. It’s easy to stay healthy all year long with tricks like this! Keep it lean and green this holiday with this healthy smoothie from NutriLiving.com! Add some all natural, whole food goodness for a kick of protein and fiber for the ultimate in digestive restoration. Add all ingredients to your NutriBullet Tall Cup and extract for 30 seconds, or until smooth. I know what you’re thinking: “Smoothies in the wintertime?” Yes. Smoothies in the wintertime. Because (1) they’re delicious; and (2) why should we let frigid air dictate when we’re allowed a tasty, icy drink? Especially when our heaters are cranked up to summertime temperatures. The berry banana smoothie is a classic. Simple, tasty, timeless. I’ve also added some maple syrup to highlight this season, and anyway, who doesn’t like maple syrup in the winter? Combine frozen fruit, sliced banana, milk and maple syrup in Magic Bullet. Proportions of fruit are based on personal preference. Pair with a bowl of oatmeal for breakfast, a savory sandwich at lunch, or satisfy your sweet tooth at dessert! I have always enjoyed making homemade lemonade, but I recently discovered flavored lemonades! So far, I’ve made raspberry and strawberry lemonades, but this slushy mango lemonade is my new favorite. I use frozen mangos to give it a cool, slushy texture. You can use fresh mangos if you don’t want it as cold. What’s your favorite flavored lemonade? 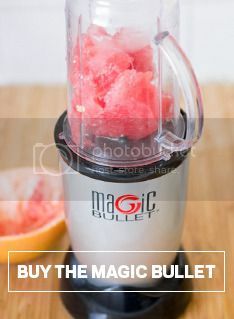 Add all ingredients to a large Magic Bullet cup and blend well. The combination of blueberries and oranges is not only delicious, but it is really healthy for you. The freshly chopped oranges give this smoothie a pulp-like texture, which I like, but you can always juice your orange (or simply just use orange juice, instead) for a smoother texture. You can use fresh blueberries instead of frozen and add some ice cubes to make it chilled.